Australian actor Joel Edgerton makes his directorial debut with the slow-burn, psychological thriller The Gift, a film that builds up quite a case for itself until its clumsy climax manages to tarnish the memory of its well-devised setup. The script, also penned by Edgerton, does include an appealing level of ambiguity not often showcased in modern American movies but it also doesn’t do much to sidestep genre clichés that crop up periodically in the story. In some ways, it is a mature film with worthy themes but it also feels like it’s trying very hard to be a movie “for adults”, often delving into oppressive levels of self-seriousness just to keep a straight face. 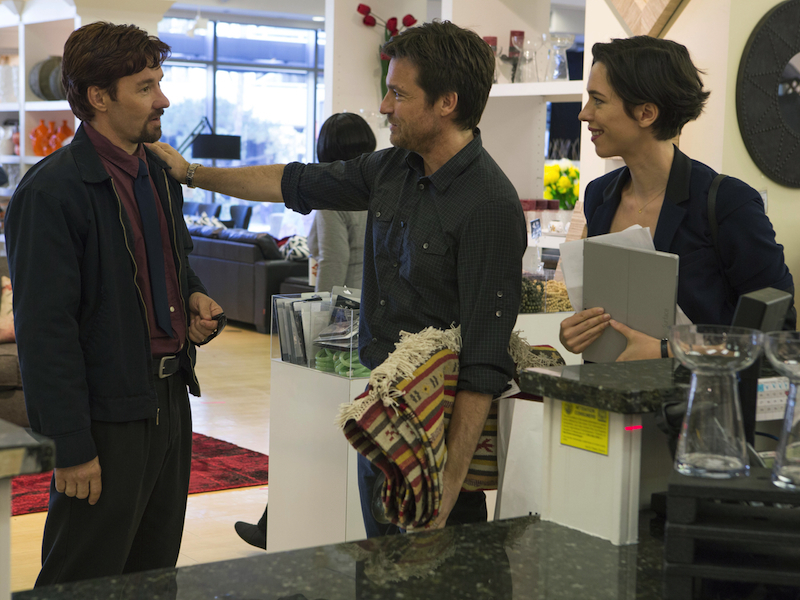 We meet LA newcomers Simon (Jason Bateman) and Robyn (Rebecca Hall) as they move into their luxurious new home with the intention of starting a new life and with hope, a new family as well. While out running errands, a man named Gordo (Edgerton, again) introduces himself to Simon as an old classmate from his high school years ago and the two awkwardly exchange contact information. What started as an “accidental” run-in develops quickly into a one-sided relationship when Gordo continually drops by for unannounced visits and sneaks unexpected gifts onto their doorstep. Eventually put off by the “friendly” displays, Simon insists on Gordo vacating their personal lives but it becomes clear that the two have unresolved issues that Gordo intends to rectify by any means necessary. The story and the film’s marketing hinge on this central mystery, the event(s) in the buried past of these two men that will ultimately lead to a climatic showdown. Edgerton does an admirable job in pacing the first half that leads to this moment and although the reveal is thankfully not done through blurry flashbacks or overwrought voiceover, its delivery is instead so underwhelming that I initially thought I missed out on all of the key information. It turns out that I didn’t; I was just expecting a revelation that matched the impact of its build up. Despite struggles with the story, the performances by the three leads are excellently rendered and contribute to the near-success of this movie. Bateman turns in his finest dramatic work here, oddly enough by using similar notes from his type-A, straight man persona in comedic works to reveal depths of desperation and disrepair hidden right under the surface. Edgerton creates a character who is steeped in creeping menace but is still not beyond fleeting moments of pity, while the always reliable Hall lends a conflicted sense of emotional intelligence that raises the dramatic stakes early on. It’s a shame that the second half and specifically the final 15-20 minutes are mishandled because there’s a strong foundation present here. If only Edgerton had stayed true to the characters instead of trying to contrive an ending intended to be shocking rather than haunting. I look forward to seeing what he does next but a few rookie mistakes kept me from graciously receiving The Gift.